OK, I'm just going to say it. I curbside shop. These days, primarily for leaves, but over the years I've also gotten other wonderful, useful things that others had discarded as trash. 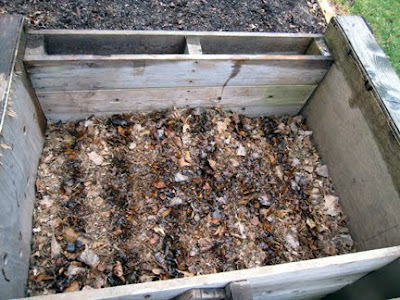 I love leaves, both shredded in my compost bin and whole as mulch on my many garden beds. I don't get enough leaves in my own yard, so I supplement my leaves each fall with those others have set at the curb. 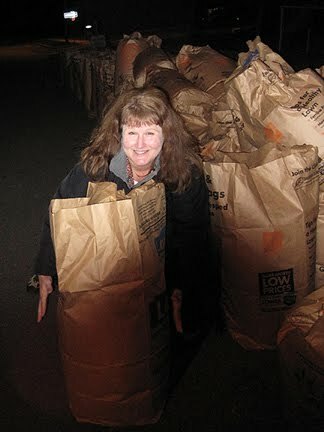 The other day I came across the hugest collection of leaf bags I have ever seen in my life. We're talking 20-quadrillion-41, or at least eleventy-nine. (Trust me, I'm a master gardener!) We're talking mother lode. The kind of plenty that makes you want to drop to your knees in thankfulness or take a long running jump into the crunchy goodness! It's important to get the right kind of leaves at the curb. Oak leaves break down slowest and are best for mulch; maple leaves break down quickest and are best compost — but that's not exactly what I mean. I mean that I only want to come back with leaves, not with brambly twigs, spent garden foliage, a leaf/grass clipping mix (though ideal for compost, I have plenty of my own grass clippings, and these bags are heavier to lift), or any other creative combination. 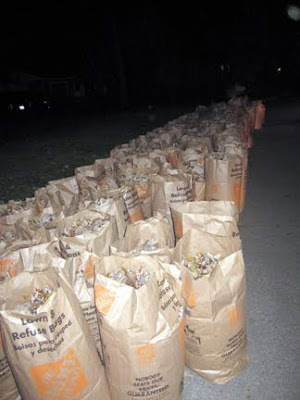 I quickly look into the bag and exclude bags that obviously contain yard waste other than leaves. However, I've found that even if a bag only has leaves visible at the top, other stuff you don't want may still be hiding underneath. To quickly gauge what else may be in the bag, I give it a quick frisk (patting both sides). If there are twigs, you will feel the edges of the bag being pokey. If there are other kinds of yard waste, they feel denser and more solid than dried leaves. This may sound ambiguous, but you'll know it when you frisk it, trust me! Next, I give the bag a quick lift a few inches off the ground to gauge its weight. If it's really heavy, it probably also contains plant clippings, which I don't want (dried leaves are fairly light). 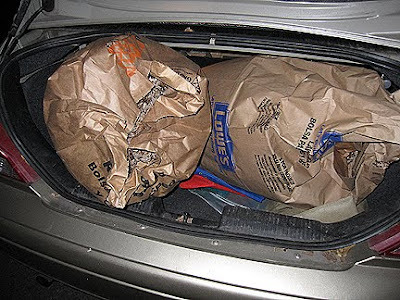 Plus, I need to be able to comfortably lift the bag into my car or trunk. I also avoid bags that are filled to the brim and those only half filled. The first will spill leaves into my car and the second aren't worth my time. Bags should be easy to handle and load. I can't stress this enough. ... and several in the trunk (more if I'd cleaned it out first!). ...and shred others (using lawnmower or weed whacker inserted into can of leaves) as browns for my compost bin. I fill it to the top in fall and by spring (when I have greens) it's sunken down halfway. I also save leaves in my shed to use during the summer. 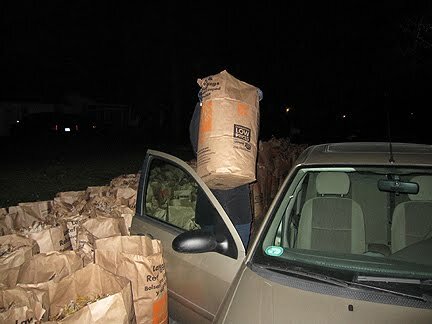 I reuse the bags for my own yard waste (remember all those buckthorn branches?!) or as weed blockers or in lasagna layering. Over the years, I've gotten some wonderful things at the curb: my beloved Weber grill, high-end ceramic pots, living plants in good health, sturdy shelving I use in my shed and basement, a glass windowpane I use to adorn my shed, and window screens that I use on top of my rain barrels and in winter on the ground to make it easy to pick up leftover seed hulls from the feeders. I've been with others who have found a bent-cane rocking chair, an antique wingback chair, a solid wood side table, other types of furniture, and designer shoes and clothes (most barely worn, and some new). I was raised with a strong sense of "waste not, want not." I'm a long-time garage saler, recycler, and reuser, so the mental leap to "trash picking" (curbside shopping is a way better term!) was natural to me. And it really got me thinking about what "trash" even is. Sure, a lot of it really is trash (unusable, dirty, or broken things; wrappers and packaging; and just plain icky, yucky stuff). But in our affluent society, people get often tired of things well before their useful life is worn out. The only thing that turns these items from valued personal belongings into trash is the opinion of the owner, not the value or condition of the object. I'd often stopped to look when something caught my eye at the curb, but I didn't start going out specifically to see what might be waiting until about eight years ago, right after my divorce. I actively curbside shopped Ann Arbor for maybe two years. Since then, the city changed its trash collection policy so all items must be contained in city-supplied carts; nothing can be left just sitting at the curb and nothing can be in owner-supplied bins. There is a wide spectrum of people who curbside shop, all with differing motivations, goals, techniques, and comfort levels. Personally, I never opened bags of trash or even lifted lids of bins; I only took items that were sitting out in the open. For me, the change in city trash rules ended curbside shopping. Also, with the emergence and popularity of online sites like freecycle and craigslist, it's been a lot easier for people to sell or give away their usable items, as opposed to throwing them out. I use both sites frequently, and am also an avid thrift store shopper. I love vintage and retro items, things with a history. Other people also dumpster dive (crawling into dumpsters at retail establishments), which I lack the physical prowess and, okay, the cahonas, to try. If you've curbside shopped or dumpster dived (dove? ), please let me know! Wow - that was a cracking haul of leaves you got there ...... and a lot easier than coming over here to have your fill of my leaves! I've never done 'curbside shopping' - although people do sometimes leave things for collection in back lanes in cities over here. When I was a sculpture student we often got bits of wood etc out of builders' skips to use for our sculptures. I remember finding a wonderful alabaster birdbath too! Monica what a great find.....leaves are precious and priceless. The best garden compost is leaf mould. In some of the communities I have lived in, folks put out good things out front or near the curb. I got a lovely set of cast iron dining chairs for which I only needed to recover the seats! If I had purchased chairs like these, they would have cost hundreds. I only paid $30 for the fabric... so I agree keeping your eyes peeled for these treasures is a good idea. I never thought of looking for bags of leaves, though, that's a great one (if you have land). WoW! Monica that is a massive line of leaves! The photo of you in utter shock and Awe at your find is really funny! You look as if you have just won the lottery. Monica, you know the old saying, "one man's trash is another's treasure!" And you certainly have found some treasures. I knew you had said you didn't have many leaves of your own and this seems a wonderful way to get them. And just think of al the romm you are saving in the garbage dump. I have been known to dumpster dive in the past til I fell once and Hubby put a stop to it. :) But I am always on the look out for a bargin. Oh, Monica, I wish I had something really clever to say here! I just loved this post, from the terminology of "curbside shopping" to the pictures of you frisking those bags of leaves:) I kept thinking, though, what if you had been stopped by a policeman for a traffic violation--wonder what he would have thought of all your "passengers," lol? A great commentary on the definition of "trash" and much food for thought. But most of all, thanks for making me laugh tonight! Nice job, Monica;-) You're amazing! I got a nice wing-back chair many years ago, when I was in my early 20's--right off the curb. It's true, some people's trash is anothers treasure. As for leaves, wow...that's a motherload, as you said. 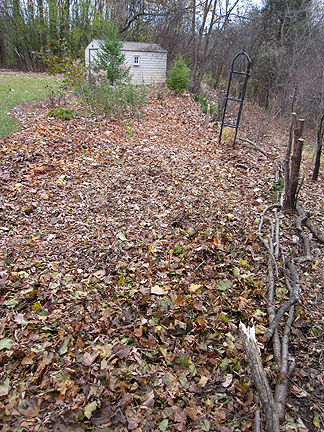 Our yard is FILLED with leaves, which in this area, are things we must rake up and dispose of. If you were closer, I'd let you come and take ours. We have loads of old, huge oak trees and other varieties, and we have to keep cleaning up the yard for months to remove everything. And even then, 'everything' is never removed. I always have layers of leaves covering my gardens until the spring. I guess they make a good insulator for the plants. I came to your blog this time by way of Horticulture Magazine's online 'best blogs' webpage! Congrat's on being listed among the top 20! I don't curbside shop but love that you do, Monica ... these photos are as priceless as the leaves! Once on a our local garden tour, I commented that the dipapidated adirondack chair in the hidden garden looked familiar! "It should," the gardener said, "I found it on the curb in front of your house!" I about cracked up at the thought of you "frisking" the leaf bags. Yes, I have done curb side shopping. It has been some time but it happens. You are so funny! You always give me such a good chuckel! You need a big truck for all those bags! I have been a curbside shopper for years...Leaves I don't need anymore, but...I've found wonderful usable gates, drift wood for the garden and just this week I found two stained glass garden thingies that I can disassemble for other uses. I love to peruse the dumpsters at remodeling sites. I don't climb in but anything you can reach and pull out is easy! This is so funny and so like myself. With me, it is pine straw. I love to use it as mulch and we don't have any pine trees in our garden. I'm always scouring neighborhoods for it. You need to get you a small truck like I did! Hi Monica! First of all, aren't you fortunate to have a good friend you can call at times such as these? Secondly, "Wow!" 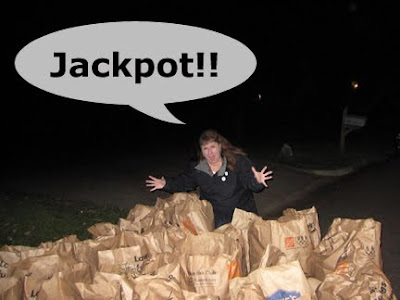 is about the best I could come up with when I saw the number of Bags with leaves! I'm so glad I don't live within the city limits!!! Wonderful treasure for you, though. Monica you crack me up with all those bags of leaves. Score!!! 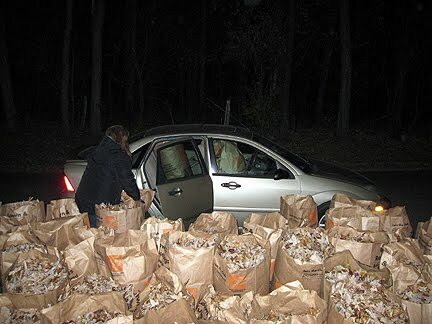 Gail's right you do need a truck for that leaf run, with a full size bed. Hello! My name is MGRR, and I do curbside shop! Oh! this isn't the 12 step program for curbside shop-aholics? Anyway...that is a lovely haul of leaves you found. I can't think of anything nicer than a big ole bag of dry crunchy leaves--unless it is bags of mulched dry crunchy leaves--lovely! Monica you asked about the spiderwort -- 'Zwanenburg Blue' is a cultivar of T. virginiana that blooms from spring until late fall as long as there is a good amount of moisture. This one is a clumper that seeds some but isn't invasive like some I have heard about. Now, I know you're a true Master Gardener because you shop for leaves. I have plenty at my house, but I understand the attraction. I shred them and place in piles around the house. I have also gotten antique chairs from the curbside before, and I live out in the country. das ist ja der helle Wahnsinn! Und eine soooo tolle Idee. Glückwunsch zu Deinem Jackpot. Die Idee ist absolut nachahmenswert. Sollte man auch hier bei uns übernehmen. 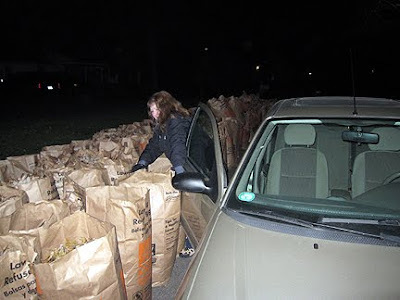 That was an unbelievable amount of leaf bags. The amount of money those people waste by buying the bags & then throwing them & all those lovely leaves away, it's pitiful. You've really got the curbside grab down to a science. This is the best post ever! Mom got loads from the curb, it somehow seems to be easier to list what she bought instead. Our kitchen cat tree and our water hyacinth covered sitting cube are such findings. The only problem is that in Germany it's techically illegal to take things from the curbside, they still belong to the people that put them outside. I'm going down the list of blogs that are in my sidebar, but won't get far before it's time for bed. I just loved this post! I'm so thankful to you for the tips on telling what's in the bags. I have one neighbor who puts his leaves on my compost pile, but his next door neighbor moved. She was the one who gave me lots of leaves. The new family has a dog and they smoke, so I haven't asked them for their leaves. I have seen some sacks, but didn't know what all would be in them. I really need to get out there and get some before it's too late. I always look when I see things at curbs, and know I've taken something before, but can't remember what. My husband and I did rescue some irises from a dumpster after a friend, who had helped here former sorority dig them out called us to say they were there. We periodically put things out to our curb, where they can be seen from a fairly busy street, with a "free" sign on them. Most things do get taken. When we got the flat screen TV my husband had to have, we got rid of our 12 year old entertainment center that way. A guy a block away took it, so we helped him carry it to his place. We were glad to be rid of it. I got some marigold seeds and plants through freecycle last year, and gave some plants away to someone who posted they would like some. I haven't been to the email I use for that for quite awhile, though, and imagine I have way too many messages to be able to delete in a decent amount of time. Tina, if you subscribed to the follow ups, I liked your story. I wish we were that handy. I think my comment is as long as yours. I also liked your thoughts about what trash is. My issue tends to be how much stuff do I really need. I have too much for the size of our house, and have trouble parting with things. When I do clean out, I think the Goodwill, or whoever I donate to probably does end up throwing some of it away. Have a great Thanksgiving and relaxing no shopping day. I have a gentleman who stops by my trash every Monday and sifts through the recycling bin for returnable bottles. We started sorting them out for him now so he can just grab the bag and go and not have to sort. It helps him and no one in my house seems to be energetic enough to take the bottles back to the store and cash them in. 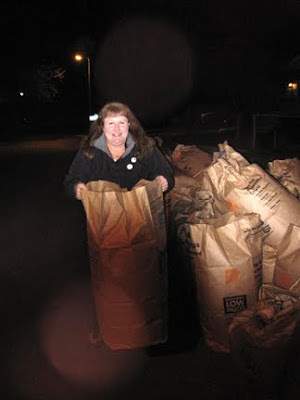 Here in Oregon, many of the towns and cities will deliver free leaves directly to your house. One year I got 3 dump trucks full. At the gardens where I work, we also use leaves from the city and constantly have a supply of wonderful leaf-mold. Probably one of the funniest series of photos I've ever seen on a garden blog. I'm astonished that someone with that many leaves didn't have somewhere to put them! The more society becomes aware of waste, and the more local authorities get organsied . . . the less there is to find. It's a bit like getting rid of coal fires. Less polution. Less comfort. Seems you had great fun! You are amazing! And, my kind of gardener. We have worn out 2 shredder machines. I used to drive pickup trucks and would "shop" your way, too. It is all free, all it takes is determination. Some of my college aged helpers said to me that I don't throw away anything, and do use everything. Ha, guess they were right about that. Quite a haul Monica! We have so many of our own leaves here I never want for more. I can't believe the Lawn Man used to pay for bags and stickers - easily over 60 of each every fall. It took a few years to convince him, but now what falls in Vegas (er. . . our yard. . . ) stays in Vegas. Saves us money, keeps the leaves out of the mega municipal composting site, and enriches our soil. 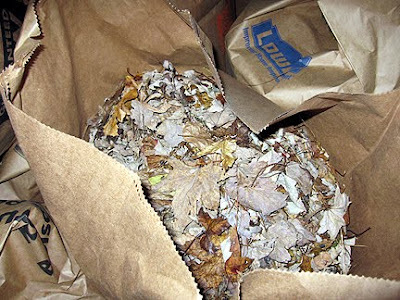 I gotta say I do like the idea of saving some leaves in bags though, as I could use them to mulch the veggie garden after the current layer of them break down. I've picked up a number of curbside treasures over the years. Around here we're still allowed to place loose stuff at curbside. We have regular haulers who prowl the streets in the evening the day before, and early in the morning the day of trash pickup. One time at my last house, when my lawn mower broke and would have cost more to fix than to replace, as I walked it out to the curb a familiar pickup truck stopped and took it off my hands. I told the driver to go around the block and come back, as I was on my way back to the garage for the bag attachment. It makes me happy knowing that anything we can't use anymore that we put out at the curb will be promptly picked up by someone who can use it or fix it and sell it to help feed their family. I joined Freecycle a while back, and will be taking advantage of that soon, once K comes over here and picks out what she wants of all the baby stuff I've been saving for her. Whatever is left will be gone in a flash once I post it. I have never seen so many leaf bags. It's unbe-leaf-able! I also confess to being a picker, and have snagged some great finds as a result. Seems to me the sensible way to approach life. OH MY GOSH is that ever a haul Monica. And you have a lot of space to fill with leaves! I have scored things from the curb in the past, but now I find that I have the problem most Americans have, even if they don't yet know it. Too much! I want to be the one setting stuff out, not picking up, at this point in my life. I'm so ready to be living a minimalist life in which the really important things are held up and the "stuff" is left behind. That said, I was raised a bargainer and a garage saler, and I love finding a bargain or something cool I can repurpose. I'm just trying to rehome some of my own stuff right now!! LOL.